The most casually elegant summer outdoor parties and often the most fun are “White Parties.” These events where everyone dresses in white against the summer night sky are as varied as the individual and organizations who host them. This includes the international network of dinners (“Dîner en Blanc”) held in cities throughout the world or white parties that can range from huge events held on superyachts or concert-sized venues to intimate affairs in someone’s backyard. Along with the outfits, watches normally should match the all-white theme although white dials with a white band are not among the most common watches one can buy. These three watches below are appropriate for these events and even more importantly, can be worn year round. The newest version of this well-known watch collection from the Swiss luxury brand combines high watchmaking, style and artisan gem-setting crafts. It is available this year in four models of varying colors, including this all-white version. The white gold case is set with 116 diamonds along the bezel and lugs and one black diamond for the crown. The white mother-of-pearl dial is highlighted by an off-centered disc at 12 o’clock paved with 74 diamonds. Different sized Arabic numerals and white Dauphine hands add a touch of whimsical artistry to the highly crafted timepiece. The all-white strap has the familiar rough texture of stingray. It’s powered by an automatic movement. This 39mm white watch provides a choice of finishes for the tonneau shaped case and bezel. For being true to the white theme, there’s the titanium case and bezel, or to add a touch of color there’s a version in “King Gold,” Hublot’s proprietary red gold. Both watches have 50 round white diamonds on the bezel. The dial is in matte white, matching the white “structured lined” rubber straps. 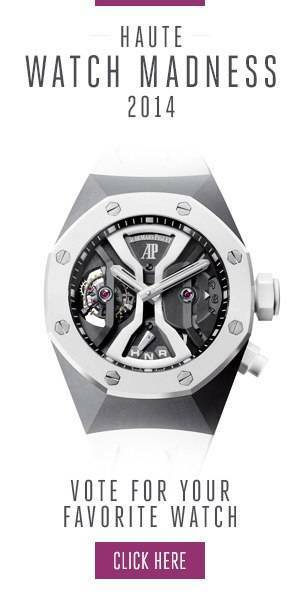 The watches are powered by the HUB1710 automatic movement with a 50-hour power reserve. For more elegant all white occasions, this watch should do the trick. The 35mm 18k red gold case has a bezel set with 114 diamonds. Inside is a white mother-of-pearl dial carved into an intricate floral pattern. A second sapphire crystal sphere contains a mechanical opening flower automaton movement. A push-button at 2 o’clock triggers a mechanism which opens the petals of an 18k red flower, revealing a briolette-shaped ruby. The automaton display lasts six to eight seconds. The watch is powered by the Jaquet Droz 615 automatic movement with a 38-hour power reserve. Completing this timepiece is a white leather strap.